Ultrasonic flow meters UVR-011 modification A5 are intended to measure the flow rate, volume flow rate and volume of liquids transported via pressurized pipelines of circular cross section in the forward or reverse direction. The meters can be either standalone or computer controlled as part of the automated control systems (ACS). 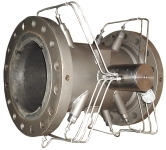 The volume flow rate is calculated by multiplying the flow rate by the cross-sectional area of the pipeline. Stationary ultrasonic flow meters UVR-011 modification A5 of increased accuracy are used for metering chemical and oil products. They are equipped with a sealed EU (Electronics Unit), power supply and communication unit (PCU) and in-line section (IS) with three, four or five pairs of electroacoustic transducers for working pressure up to 10 MPa. Ultrasonic flow meters UVR-011 modification A5 perform measurements in one pipeline. The measurement results are transferred to the PC and are output in the form of a pulse sequence. 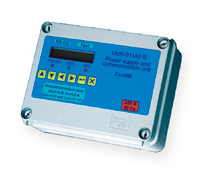 The meter provides an output of measurement, diagnostic and reference information via the RS-232 serial interface. The meter measures the volume flow rate using measuring sections (hereinafter – MS) with a nominal diameter (DN) of 100 to 300 mm. Operating pressure in the MS is 1,6 MPa, 6,3 MPa, 10 MPa. The limits of the permissible basic relative meter error during flow and volume measurement is in the range of flow rates from Qmin to Qt – ± 0,25%; from Qt to Qmax – ± 0,15%.